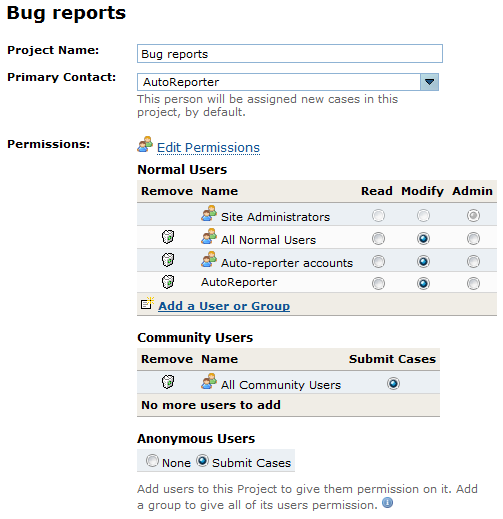 See managing bug reports in issue tracker for common information. Please, read it first. For common information and setup of FogBugz itself - please see this article. The text below assumes that you already completed FogBuz installation. 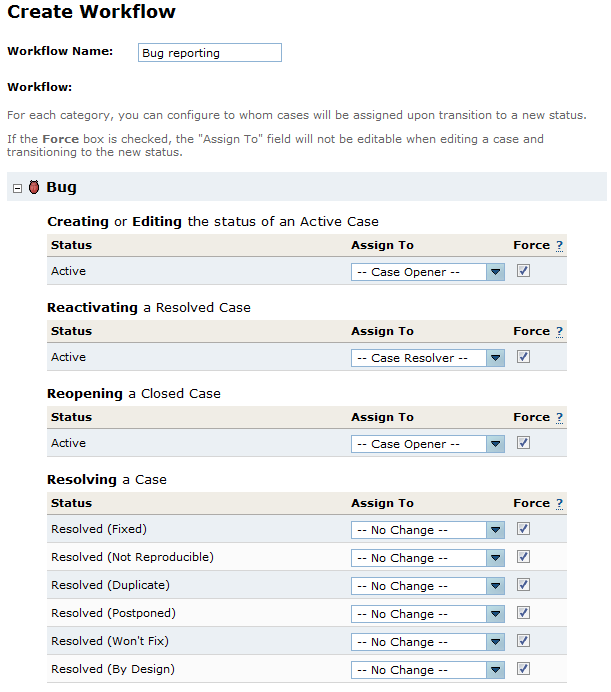 Below are detailed steps for recommended FogBugz setup for automatic bug report submission. Before going through setup - make sure to upgrade your FogBugz to the latest version. Some steps below are optional, some steps must be executed only once (like custom fields creation), other are executed from time to time (like creating new projects for your new products). 1. 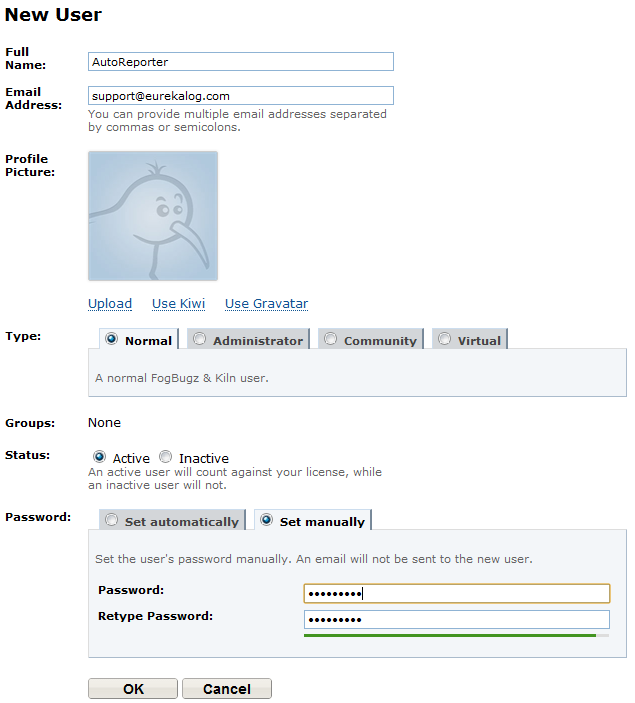 (Admin/Site configuration) Create custom field to improve usefulness of EurekaLog. Most important field is "Version" - to store version of your application (name must be exactly like this, if you want EurekaLog to auto-fill it; otherwise you will need to fill it manually). Other suggested custom field is "Computer" (to store platform information). Again, field name must match or you'll need to manually fill it. 1. (Admin/Users) Create new use account for bug report submission. Make it normal or community user. E-mail can be anything. It may be good idea to use dummy e-mail address (i.e. non-existent e-mail). You may want to create additional accounts for each of your products - for increased security (you can join users in group to simplify control). 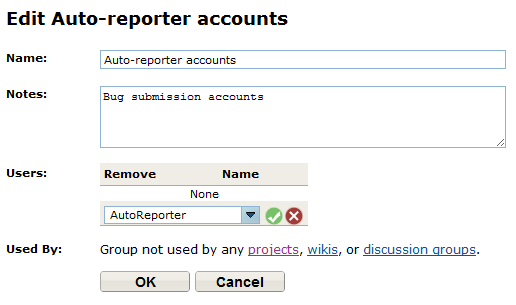 Note: you can use anonymous access for bug report submissions (see also). However, currently anonymous user is not supported in FogBugz API (see also). You may also consider using HTTP upload send method to upload report directly to anonymous bug report page for reporting anonymously. Even though limited, anonymous submitting is more secure, since access password isn't stored in your EurekaLog-enabled applications, so end-user can't mess with settings. Now, back to using real using and full access to FogBugz API. 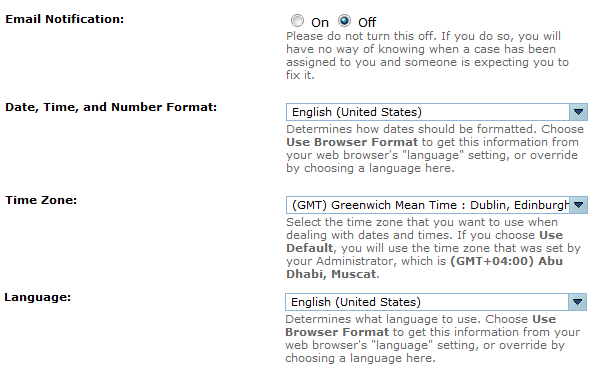 Please, select only minimum necessary access rights and remove any other. 2. Create area for the projects. If you don't need area - use "Misc" area. If you already have area - assign it. If you have master-project - you can clone project to get pre-set settings. 3. Set any other project properties as needed. Assign workflow to your projects. Important Note: we recommend to use API keys (tokens) when possible. If you are still going to use login/password pair (for example, you are using old FogBugz version, which does not have API keys) - use your user name as login. Even though FogBugz asks for e-mail address as login, we've found out that it's perfectly fine to have several users with same e-mail account, and login with user names instead of e-mail addresses. 1. 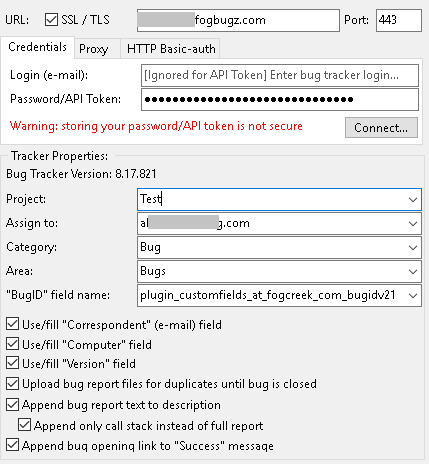 Click on "Test..." button to test sending and creating of a new bug issue in FogBugz. 3. Once successful and there is new issue in FogBugz - click on "Test..." button again. This should test updating project. 5. Once successful - close existing test issue in FogBugz. Optionally - set the BugScout status (see customizing feedback). 8. Delete test issue in FogBugz after testing. 5. Ensure that you get all files and additional information in FogBugz.